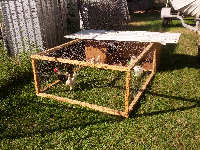 Well my new little bantams needed their own house. So this morning I scouted the recycle centre and found this little cupboard. So set about constructing a house and run. I am hoping they will be able to roam with the others. 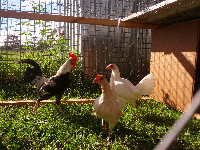 But until I am happy they are healthy (always quarantine any new birds). And if the rooster does mix then they have their own run... They are only small after all. 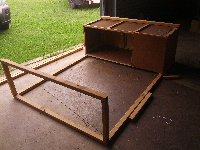 I kept the doors for the back, so I can use them for access to food, water and their roosting box. This was just a case of cutting off a small panel, from the side I removed and nailing it back. Then used an old wardrobe draw as their box - so should make cleaning easier. Now it still needs a proper roof, but at least their out of the shed.